Sandos Cancun Luxury Resort is a one of a kind hotel presenting the right blend of beauty, elegance and understated luxury allowing for the most discerning travelers to fully relax. Our exclusive “Total Gourmet Experience” will awake your senses and delight your palate with a variety of exquisite flavors; and discover a new lifestyle entertainment experience for your luxury getaway, a blend of music, cuisine, fashion and culture known as The Rhythm Experience. 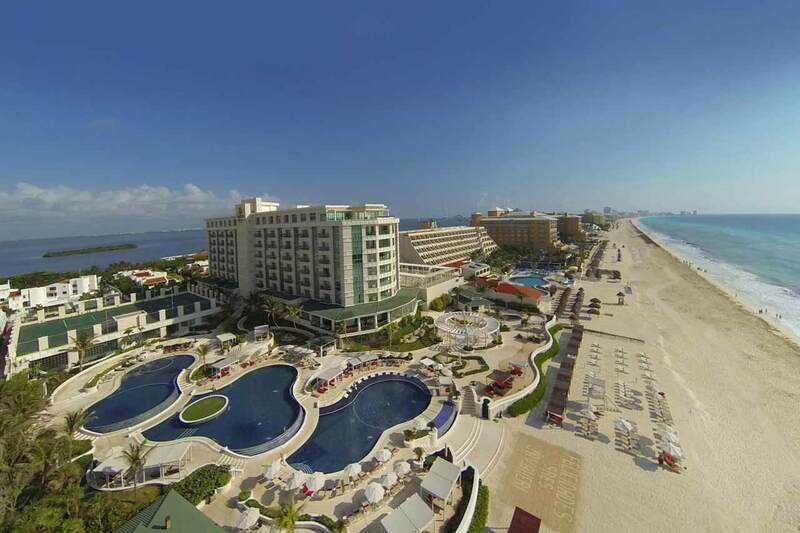 Sandos Cancun Luxury Resort is strategically located on one of the most beautiful beaches of Cancun, at only 10 miles from Cancun ́s International Airport and very close of the main shopping areas and night life of the Hotel Zone. Choices of recognized golf courses are within easy distance of the hotel and will enhance the stay of the golf enthusiast with choice and variety. 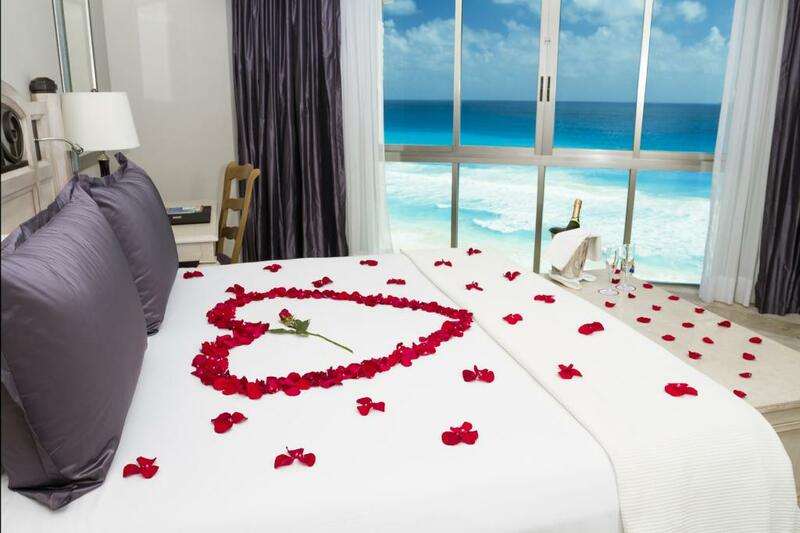 The Sandos Cancun Luxury Resort offers different room and suites categories from which to enjoy the splendor of the Caribbean Sea and the Nichupté Lagoon. Sandos Cancun Luxury Resort has 214 modern rooms including 27 luxury suites with spectacular view to the Mexican Caribbean Sea and the Nichupté Lagoon, furnished with top quality bedding, sitting areas, marble bath fixtures, separate shower and tub, hair dryers, bathrobes, slippers and luxurious amenities. 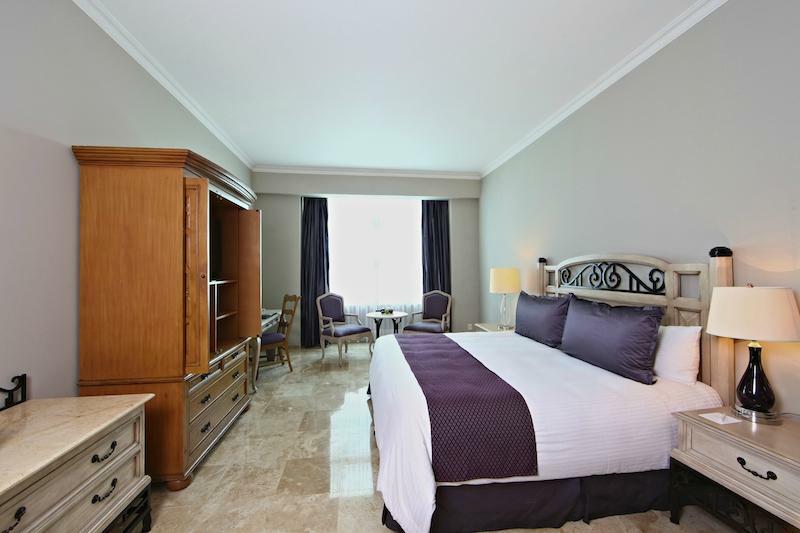 All rooms are elegantly furnished with modern designer fixtures. 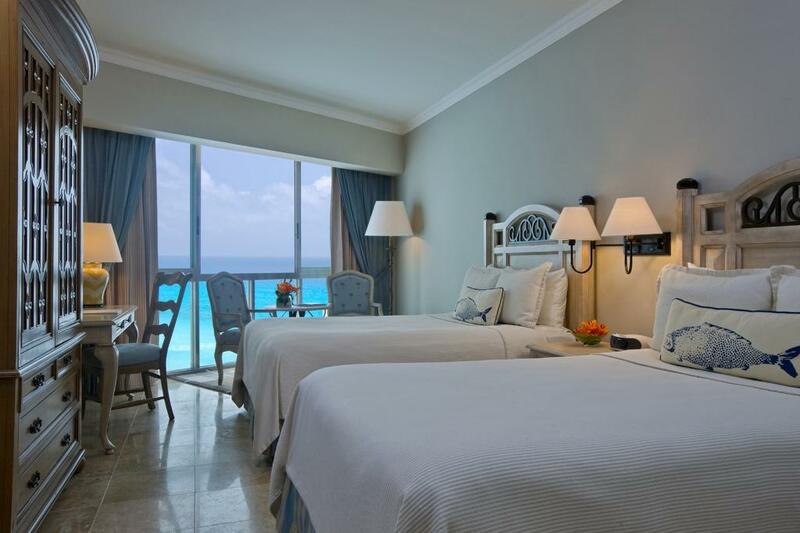 With a beautiful blend of sophistication and Caribbean style, these 450 sq ft guestrooms provide guests with an intimate and luxurious Cancun all inclusive escape. Each comes complete with a variety of excellent amenities like 24-hour room service, in-room WiFi, a marble bathroom and much more. Experience an all inclusive resort stay with striking views of the Caribbean Sea and Nichupté Lagoon when you choose the Deluxe guestrooms at Sandos Cancun Luxury Resort. Each of these spaces has 450 sq. ft. of luxury so you can relax in an upscale oasis. Take advantage of the room’s modern amenities and services for an idyllic stay. 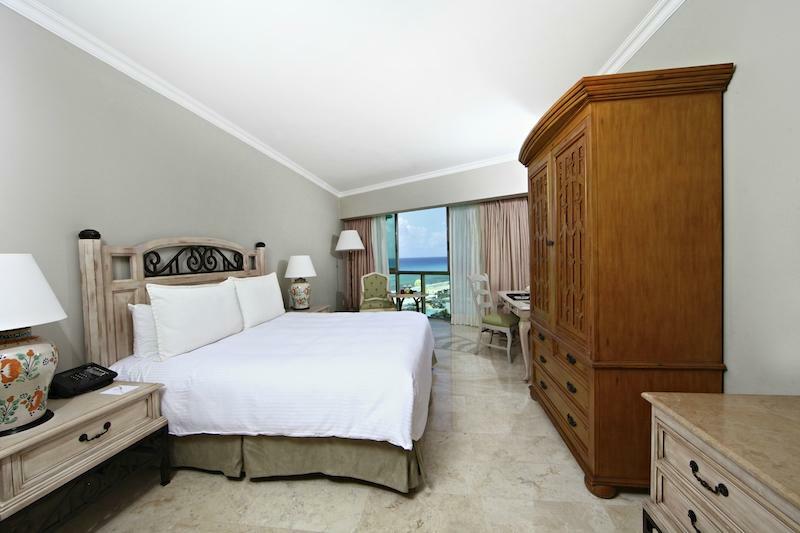 This luxurious and spacious suite features a comfortable living area along with a separate bedroom. You’ll also find impressive upgrades like a kitchenette, a private balcony and two flat screen TVs so you can enjoy all the comforts of home during an unforgettable getaway at our all inclusive resort in Cancun. Experience an unbelievable getaway at Sandos Cancun Luxury Resort in the Lagoon Suites, featuring two private balconies overlooking the Nichupté Lagoon and the ocean. Step into a calming atmosphere filled with amenities, offering plenty of extra space along with a kitchenette, a living area and a separate bedroom. 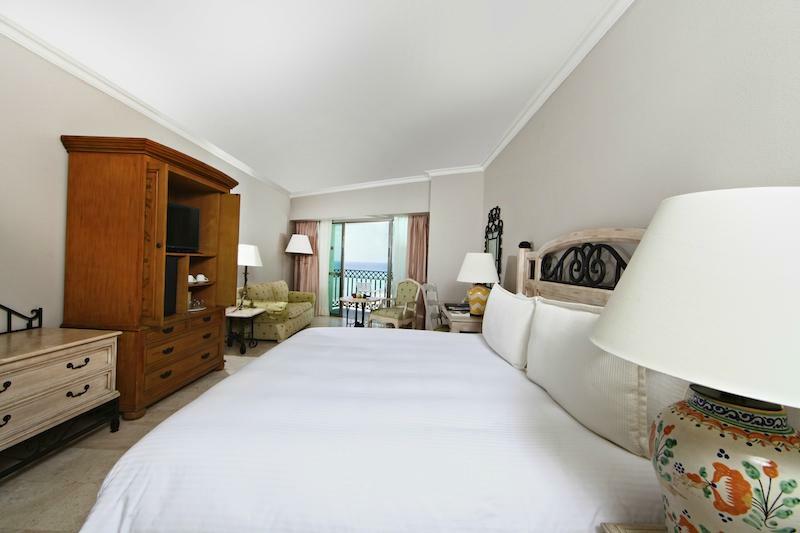 Covering an impressive 1,160 sq ft, our Caribbean Suite features a large ocean front terrace so you can indulge in panoramic views of the Caribbean Sea. In this incredible suite, you’ll find a living room, three flat screen TVs, a kitchenette, a separate dining room and two bedrooms. Sandos Cancun Resorts Total Gourmet Experience will awaken your taste buds with a variety of exquisite contemporary flavors and drinks. Buffet: The modern Zango restaurant serves a luxurious breakfast buffet every morning with all kinds of favorites to choose from, as well as international Buffet and a la carte lunch and dinner..
Á La Carte: Savor mouthwatering cuisine from our collection of four upscale restaurants with steakhouse, Italian, Teppanyaki, international and Caribbean cuisine. Snack Bar: Stop by our poolside snack bar St. Trope for tropical drinks during the day, and relax in our chic lobby bar in the evenings for a refreshing vacation.